I have an ex; a toxic one but an ex, nonetheless. There was so much about her that I never understood; all but one thing. I once asked her what she identified as. She proceeded to tell me that while she identified as pansexual, she chose to tell people she was bisexual. At the time, this was a little tough for me to understand. However, over time, I began to understand why she did it. In my opinion, there is a sort of stigma around being pansexual. People refuse to believe that anything exists outside of the gender binary. This makes it tough for them to understand the difference between bisexual, pansexual – and omnisexual, even. This system of belief is not restricted to only outside of the queer community. It exists within it, as well. Do we really need labels? There are two parts to this argument – both of which I equally believe in and hence am over the fence. The first argument is that labels restrict us. In Indian society, being cig-gendered and heterosexual is the norm. Getting married is the norm. Having kids, and starting a “hum do hamare do” family is a norm. Stepping outside of these norms in any sort of way, shape, or form, has consequences. But that’s the thing, isn’t it? Just as labels restrict us, so do norms. The belief is that anything that has a set of rules will restrict us. More times than not, we abide by norms only because we are afraid of the consequences if we didn’t. We will be trapped in the square we’re all so afraid to step out of because, what if…? The queer community – along with being a minority – is stepping outside set social norms. So, if they anyway are, then why not let go of another thing like labels that do nothing but restrict us. Then there is the second argument. The one that talks about the narrative of queers that have fought to legitimize queer status – be it politically or socially. The view is that early queers – and in countries like India with an ongoing battle even queers today – believe that letting go of labels would mean letting go of an identity. Letting go of this identity that represents who we are may invariably mean letting go of the #proud status queers today are happy to own and love. When you start to ignore a part of you, the fear is that there may come a time when you forget about the struggle of accepting that part of you. 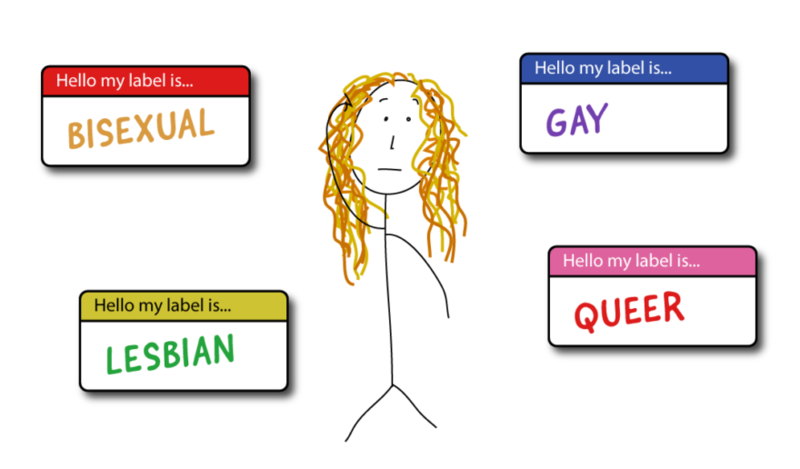 There is also the fact that labels help us define who we are. They give us an identity. As a human being, it is easier to define who we are as it helps us develop our sense of self. The bi-pan story makes the fact that labels restrict us is very evident. In my head, I would not think as much about whether I like two genders and also a third and a fourth and a fifth and still tell people that I am bi. However, when someone asks me, I choose to tell them that I identify as bisexual just because it is easier. It is easier to tell someone indirectly that I agree with them about the gender binary when that isn’t even the message I want to pass on because I do not believe in it. Reading between the lines much? Well, maybe a little too much. Then there’s the third argument that keeps popping into my head which makes me tell people that I identify as queer and not as bisexual. This is a well thought out conclusion that I have come to post discussing it with a friend way too many times. And more times than not, the conversation started with, “I am overthinking this only for my own mental satisfaction”. The reality of the situation, however, which I chose to ignore, was that it wasn’t. While it was more for my mental satisfaction, there was also the looming question that how will people react when I tell them? Most people who are unaware may relate queer to gay. Is gay bad? It most definitely is not. Hence, saying queer and being mistaken is not as problematic – at least in my head – than letting people think that I believe in something that I don’t. With Pride march just gone by – at least in Mumbai – there is no better time to take stand up, take pride, and acknowledge the struggle you have gone through to get where you are today. When identifying with the community, whether you choose to label yourself or not, be proud about it. Take #pride in who you are and who you identify as and do not let anyone ever tell you that there is a right or wrong way to be proud besides the one you believe in. I am a 19 year old who enjoys dark humor, conspiracy theories, psychological horrors and solving math equations. I am passionate about mental health awareness, body positivity, and supporting the Queer Community. I try my best to voice my opinion about the same whenever possible. Next post Stop Everything And Watch “Naughty Amelia Jane”?